The ever-growing interest in STM comes in many varieties. At the e-Navigation Underway International conference, STM was one of the testbeds that was given the most presentation time. Several other international projects and initiatives are making their solutions “STM-compatible”. 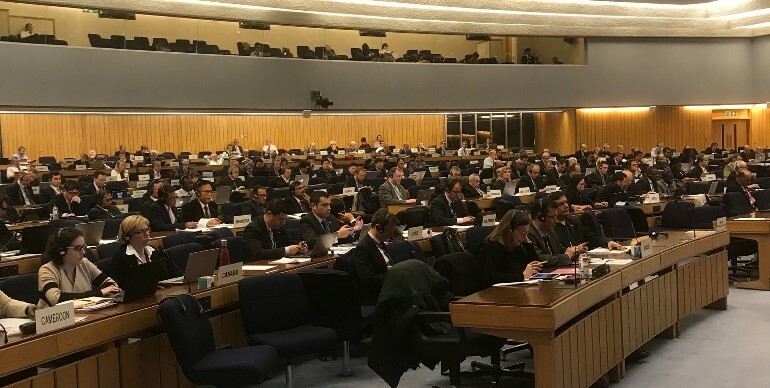 And on February the 21st, STM was invited to share the STM progress to the 5th session of the IMO Sub-Committee on Navigation, Communications and Search and Rescue (NCSR). “As the probably largest e-Navigation project in the world, the interest was high as expected, “says presenter Ulf Siwe, Communications Officer of the STM Validation project. The presentation took place in the main hall attracting a large audience. The progress of STM was in focus as well as the alignment of STM with IMO Strategic Implementation Plan and the Maritime Services. – Could you send the presentation? Yes! – Will this affect COLREGs? No! – What services can a bulker with STM on-board use? They can us all STM-enabled services in operations that they would like, e.g. enhanced monitoring in Danish waters, winter navigation in the Baltic, weather optimization, and better synchronized arrival information from the 13 ports in the project plus Port of Rotterdam, a new cooperation! The final message to the IMO delegates was crystal clear. “Get involved” and help the STM solutions become even better.